Quick reflexes? Fast thinker? Good hand-eye co-ordination? If you loved the old arcade shooter games, you'll love Time Attack! Hunt down vampires and other Halloween monsters! 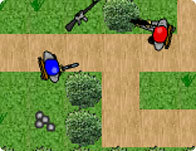 Play as the cursor to shoot down spheres. The Martians are here! Jump into your own auto fire U.F.O and take on legions of spiked martians while dodging monstrous asteroids. Dodge their attacks to stay alive and save Earth. A dynamic anomaly has been detected in the Galaxy. Grab your ship, check it out, and neutralize the threat. Fly ROFLcopter and destroy LOLLERskaters and LMAOplanes with OMGmissiles.